How do we even begin to start describing this?! Well, perhaps most importantly, it was made for a great guy called Dave Philipps who is generously sporting the DJ we made for him in this photograph. After going through the initial order with Dave, he gave us some of his home farmed eggs. I would challenge anyone to compare a true organic egg to a supermarket egg – you will never want to choose the latter again. 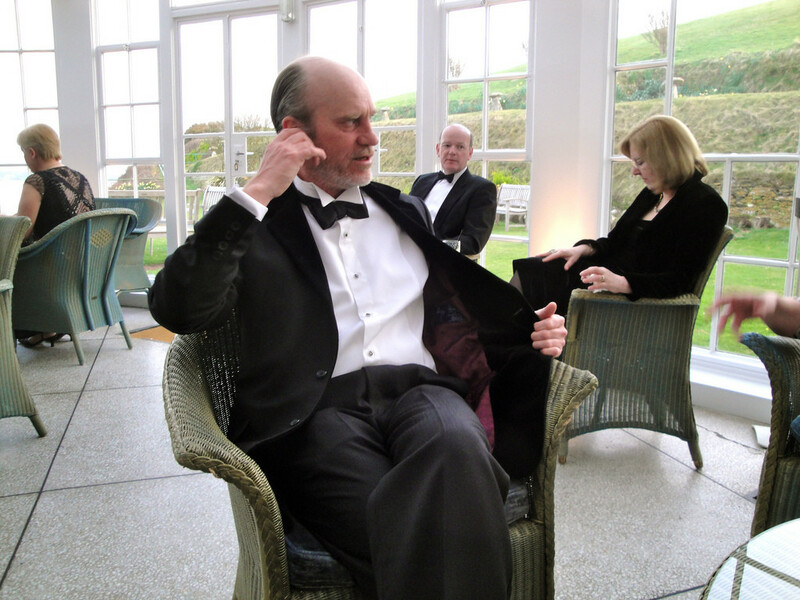 Dave wanted a special Dinner Suit for his stay at the wonderful Burgh Island hotel. He needed it in a hurry so we offered him Henry Herbert’s Express service (we charge slightly more to have a suit ready twice as quickly). Dave chose three different fabrics – a Paisley lining from Lear Browne & Dunsford in Exeter, the wool for the suit from Hield in Huddersfield and a stunning velvet trim for the top collar from Holland & Sherry, on Savile Row. You can imagine the demands in synchronising the delivery of all three different fabrics from three different mills, for an already demanding time delivery for the suit. To add to everything, Dave chose a top collar lining, which is an incredibly intricate piece of tailoring, but looks stunning on a Dinner Jacket. And, in between it all, we still managed to squeeze in a baste fitting! A very busy time making a very special suit for a very special place for a very happy (and special) customer. Phew!! See also: Bespoke Tailor, Burgh Island, burgh island hotel, Dave, Dave Philipps, dinner jacket, dinner suit, egg, Exeter, Henry, Henry Herbert Tailors, Herbert, Holland, holland amp, intricate piece, Savile Row, savile row tailor, Sherry, Shirts, suit, Suits, Tailored Suits, wedding suits. A Complicated but Worthwhile Besoke DJ - Bespoke Suits By Savile Row Tailors.